What is an Iowa Last Will and Testament? 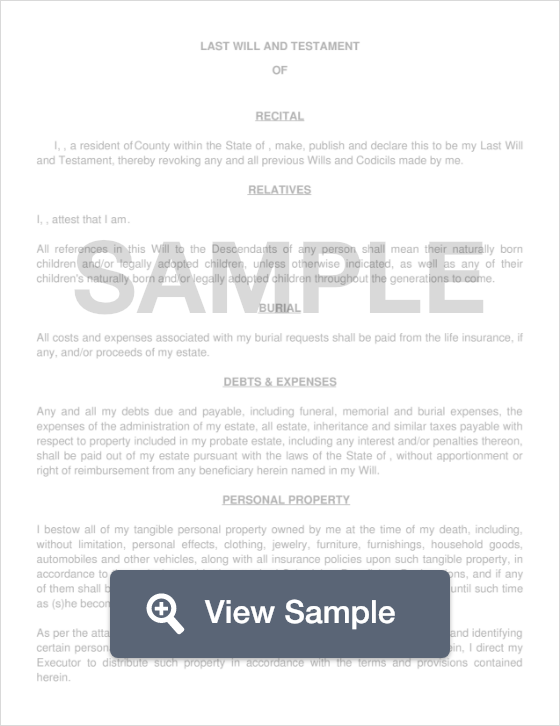 Iowa Last Will and Testament: What Is It? In the state of Iowa, a Last Will and Testament is a legal document that is created by a Testator (the person creating the document) that ensures that his or her assets and property is properly passed down to the person or people of their choice once he or she is no longer living. For example, Sarah Smith may create a Last Will that leaves her entire estate to her two children, including her house, cars, digital assets, and all financial assets. In the same sense, Sarah may leave her entire estate to charity, or set up a trust, perhaps because one of her children requires special care. In the state of Iowa, a Last Will must be signed by two witnesses, as well as a Notary Public. Witnesses - According to Section 633.279, the Will must be signed by two (2) witnesses who are both present when the Testator signs. Pets - Names, descriptions, etc. Life Insurance - Policy number, contact number, company name, etc. State whether or not your children will be named as beneficiaries. If so, provide how much or what percentage of your assets they will each inherit. Specify if you’d like to set up a trust for someone who may suffer from a disability or a mental illness and may require specialized care. Doing so can prevent any issues that may affect their ability to receive Supplemental Security Benefits or other government benefits. In the state of Iowa, your witnesses must physically witness you signing your Last Will. Be sure that your Will is also notarized before submitting it to your attorney and other financial institutions.